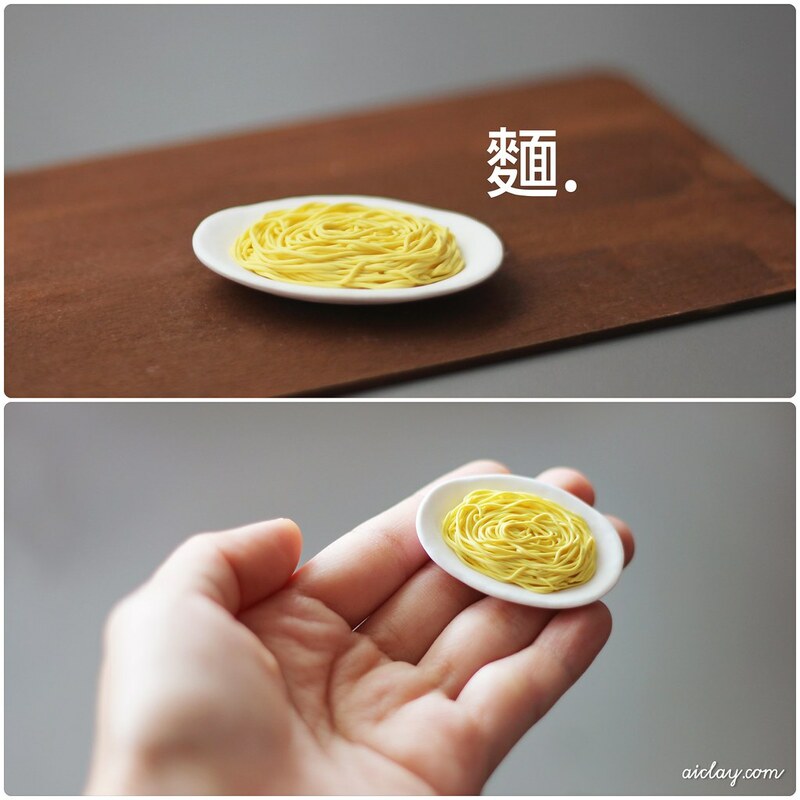 AiClay - a Haven of Miniature Food: Noodles and Strawberries. I'm sorry for the neglect, dear blog. I gotta be honest, I got a tad disheartened by the lack of feedback I get on the blog as compared to AiClay's facebook page, and started using the latter to share my works instead. But yesterday, I chanced upon a comment (drats I can't remember where I read it), but it was about how she loved reading my blog and my heart just swelled with warmth. So here I am, maybe it's more troublesome to leave comments on blog entries, or maybe there are really fewer people reading this. BUT it's okay, even if there's just ONE reader returning to this blog, I'm gonna keep it going. Let's celebrate the revival of this blog with something very Asian and true to my heritage. Noodles, or 麵. It took me darn long to roll these strands of noodles out to the thickness I wanted and for them to be uniform. At least, it was fun assembling them on the plate. This was for the collaboration between Dragon Nest and AiClay. Which is also the main topic for the last day of filming next Monday! I can't wait for 'it's a wrap!'. Maybe I should celebrate THAT by making a miniature sandwich wrap. -distracted. 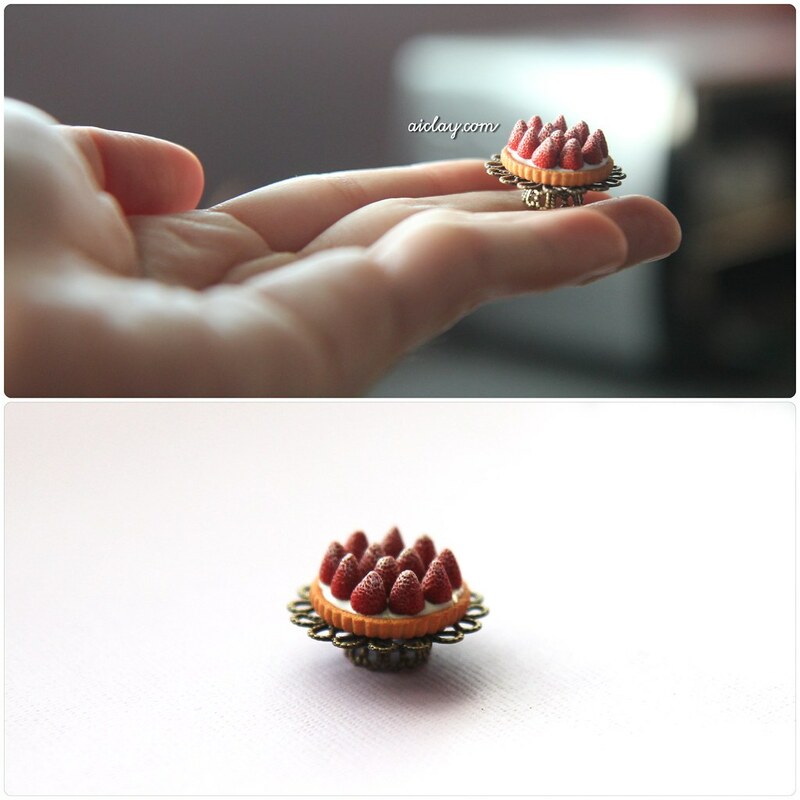 Here we've got a miniature strawberry tart I sculpted during Show and Tell for the filming. Can't wait to see how the videographer filmed the segment when I was poking the little holes in the strawberries, the camera zoomed in pretty close to me that I knew. Just a sneak peek at behind the scenes of filming. I promised the filmat360 team I wouldn't leak out too much, so this is all I can share. This week will be my birthday weekend, so I'm hoping for an awesome one. Happy birthday to any March babies as well! ♥ Till next time! I rarely comment but I do enjoy reading it a lot! I think your works are awesome! I'm not sure but I think lots of people just read and don't comment. On Facebook it seems easier to comment probably because there are lots of other people commenting. Oh! I should probably comment too then... I read your blog whenever you post! It's in my RSS feed so I get an automatic update!! I didn't even know you had a facebook page! So I have been seeing not very many updates at all! I think it's easier to reply or "like" things on facebook... especially if you haven't turned off the dumb "authenticate code" thingy on your blog (they make those almost impossible to read now, I've actually given up leaving a comment on a blog because I couldn't read the code they wanted me to enter!) But we are here! We are reading, and I personally love your work!! Happy Birthday and I too read your blog but sometimes I can't post a comment because Im at work and they monitor us...my computer at home broke so you are my entertainment for my break at work...thank you for blogging. I chanced upon your blog a while back and since then Im loyal to it. I check each morning with my bleary eyes and cup of tea! Facebook is good but to me this blog is YOU. You have talent coming out your ears and I hope one day Ill win the lottery to fly out to Singapore to one of your workshops. Looking forward to the vids! Hey there, I am a viewer also! Will we see the completed video at some time? I don't often comment, because sometimes it seems I have nothing more to say than, "Oh my gosh that is gorgeous!" Or "How fabulous!" I am almost certain I follow you on Facebook as well, but I truly love reading your blog posts! Please keep them coming! Hi Jocelyn, I'm sorry, I'm a guilty one that always reads but doesn't often comment! I know exactly how you feel, it warms your heart when someone comments and you know that your blog has been read! I am visiting Singapore in September as I was born there and I was a March baby 50 years ago :-) I am very excited! I'm awkward and here are some macarons.